About 17,000 people took to the streets of the Austrian capital of Vienna on Saturday to participate in an anti-government demonstration, Sputnik reports. "According to our estimates, 17,000 participants," a police representative said on Saturday. The actual number of demonstrators exceeded the expectations of the organizers, who expected around 10,000 participants. The demonstration was timed to the anniversary of the current coalition government coming to power in 2017. The coalition consists of the conservative Austrian People's Party (OVP) and Freedom Party of Austria (FPO). 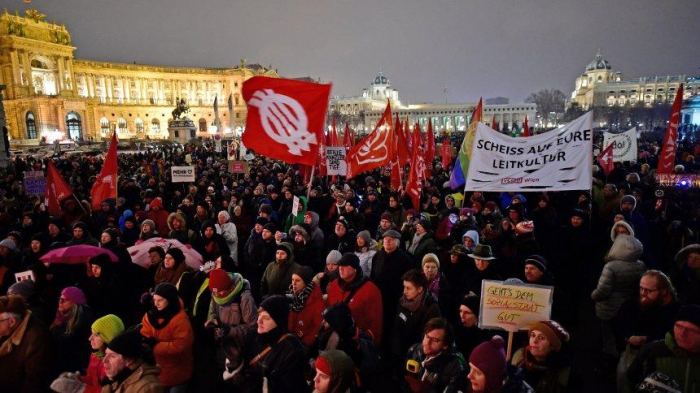 The participants of the rally mainly protested against the migration policy of the Austrian authorities, as well as demanded to reduce the working day and cancel the austerity measures. Because of the protest, many streets in the city centre were blocked, and the movement of ground public transport was seriously affected. The demonstration took place without incidents. Since 2015, Europe has been facing an acute migration crisis, with scores of refugees arriving there to flee conflicts and poverty in the Middle East and North Africa. Austria is among the European countries willing to diminish the influx of migrants.